Before I start, how many women and men reading this can they that they’ve been successful with choosing their own partners over the years? It was only recently that I became aware of just how popular “Match Making” had become. I had been working with a female client of mine on improving the effectiveness of her ability to convert dates into second, third, and fourth dates; eventually leading to guys asking her to enter committed partnerships. During this she revealed to me that just before hiring me she was consulting with a few match making agencies to pair her up with gentlemen in New York City. I initially joked about the idea until I did some research and found out just how big the market was. The problem I discovered however, was that the agencies weren’t effective at getting to know the people they were matching on a spiritual level. They were just looking at income, education, and surface level characteristics that for the most part were hit or miss. Since I had been getting to know my client over the past couple months, I decided that I could do a much better job at scouting and pairing her up on dates with men that matched all the attributes she wanted, the characteristics she was looking for, and the deep intangibles that women need to be content and satisfied in their relationships. Often times women assume that just because a man is on her level from an educational and financial standpoint that the men are also on their level when it comes to developing, maintaining, and generating attraction. How many women out there have gone on date after date with men who were everything they could want “on paper” that they just didn’t feel anything for halfway into the date? I bet this is the case for most of you. Every woman I have ever worked with has told me this story over and over again. The truth is, a mans ability to remember what is in his school books and master whatever field he is in has nothing to do with his ability to generate attraction . Just as there are people that can tell you everything about history, and nothing about math, there are people that can tell you everything about almost anything, that don’t know a thing about dating, love, and generating attraction. Because we feel it, we all think we get this thing called love, but the fact is most of us has never been taught how it works. We see it in television, movies, plays etc, but it never seems to translate into real life. The movie love is false, and not even that last more than two hours – which is about the length of many peoples first and only date. Women especially think they’re good at generating attraction, and while most admittedly are good at that in the beginning, few are good at maintaining that attraction over a long period of time. It’s only recently that we began to marry for “Love”. Traditionally marriage had a greater purpose. We can’t debate the fact that “Love” is a feeling, and feelings go up and go down. Therefore building a marriage off of a foundation of “love” isn’t very reliable. It would be like building a house on a giant see-saw; and this is what we have today. The current divorce rate is in the USA is at about 53%. The divorce rate in other western based “marry for love” countries like Spain and Portugal are at 60%, and Belgium being as high as 70%. Meaning that in countries marrying for “love” you can flip a coin and it could predict whether or not your marriage actually has a chance at standing the test of time. India, a country home to many arranged marriages has a divorce rate that is projected to be from 1-15%. With several cities in india having a divorce rate as low as 4%. Now we can make a million arguments for why we believe that is the case, but the one thing that can not be denied is the numbers. Men lie, women lie, and numbers don’t. The fact of the matter is, their marriages are lasting, and despite how much more forward thinking we assume we are than them we’re not making it work. For us marriage is a 50-50 shot, for them marriage has a 95% chance of lasting. I’m not going to go so far as to say they’re doing everything right, but I think it would foolish to not admit that there are things we can learn from them. America has 4 times more people using drugs than india, a murder rate that is twice as high as india, 1500% more rapes than india, 700% more total crimes, and it keeps going. You can check all of that research here. We can even look at the “reported” domestic violence, there are 300,000 domestic violence cases reported a year in India versus the 10,000,000 reported in the US. Thats a little over 3000% percent more here than over there. And did I mention that India has a population 400% higher than ours? Now I’m not going to deny that many unreported domestic violences cases do occur both in the USA and in India, but for the numbers to be matched considering the population difference there would have to be a total 12,000% more unreported domestic violence cases over here and thats just to match our “reported cases” . The number goes up even more when you consider the USA reported cases combined with the unreported ones. But, even if ours were slightly lower, can a man thats killed three people, look down on, and judge a man thats killed five? I only say all of this to say that even if our rapes and domestic violence cases in the USA were on par with india – which they aren’t, ours clearly being significantly higher, but even if they were – Their “arranged” marriage success rate is still leaps and bounds above our “marry whoever you love” success rate. And did you know that arranged and self marriage couples show little to no difference in overall martial satisfaction? There was a research study conducted in which they took ten random women, then ten random men, and had them sit with each other in a room for nine hours reading each other love poems, and telling each other they loved each over and over again. After the nine hours, 4 of the 10 couples had decided to get married. And what they discovered was love wasn’t this “magical” thing that hollywood makes it out to be. Love is just one of the strongest emotions, and those emotions can be generated at random depending on a varying degree of variables. In my personal opinion it takes a village to nurture a healthy marriage just as it takes a village to raise a child. We live in a culture in which moving from relationship to relationship is the norm. And not just that, we’re constantly reminded of celebrity break ups and divorce through the media. Many of our parents got divorced if they got married at all. Not to mention the amount of options we’re constantly reminded that we have today; the popularity of online dating can accept some responsibility there. If a man and woman that lived on a small farm in an extremely small town without cell phones or internet got married do you think they would break up over a big argument? Probably not, because their chances of meeting someone else that they would be both attracted to and have compatibility with would be slim to none. Now if those same two people lived in a mega city like right here in New York it’s much easier to break up. Not only are our dating apps full of millions of men and women looking to date, but there is an attractive man and woman walking up the street every ten minutes. There are clubs, bars, and cafes full of interesting single attractive people that could all potentially be your next “high” – your next hit of the chemical “love”. We need a culture that enforces staying together and working it out even when you may not exactly “feel it” the way you did before. Most people still get up and go to work everyday even when they don’t “feel it”, because they value the importance of making money over their feelings. So why don’t we value the importance of developing structured healthy marriages and families as much as we do money? Feelings can be recreated upon proper stimuli, and if we put less energy into “giving up” and more energy into “working it out” we could quickly realize this. You only need to do a little research to discover the many benefits that marriage has on the maintenance on a quality society. I posted those divorce statistics but imagine if I had access to some statistic that told me the percentage of regular everyday relationships that had long term success. It’s obvious that those numbers would be far more dramatic. For all of these reasons I decided to begin doing matchmaking for my female clients. I would do it for my male clients too if they actually came to me to find a consistent relationship. Most men of the men are looking to widen their options because they don’t have access to the same level of options that women do. Most of the time they have to pursue; women on the other end are the pursued. I begin my process going out during the day and during the evening gathering men that fit the profile that women are looking for. I then meet with them for lunch, dinner, or coffee to interview and screen them for the qualities and attributes the women that hire me are looking for. But most importantly, I’m checking to see if they have the deep rooted alpha intangibles that women love, but just can’t put their fingers on. When I believe I have a match I communicate with them both to make suggestions on how they should handle the date to maximize their chance of a successful encounter. I then set the date, stand back, and let the magic happen from there. If requested, one more date is organized by me personally, I think act as a mediator between the two to keep things on track until it becomes self sustaining. 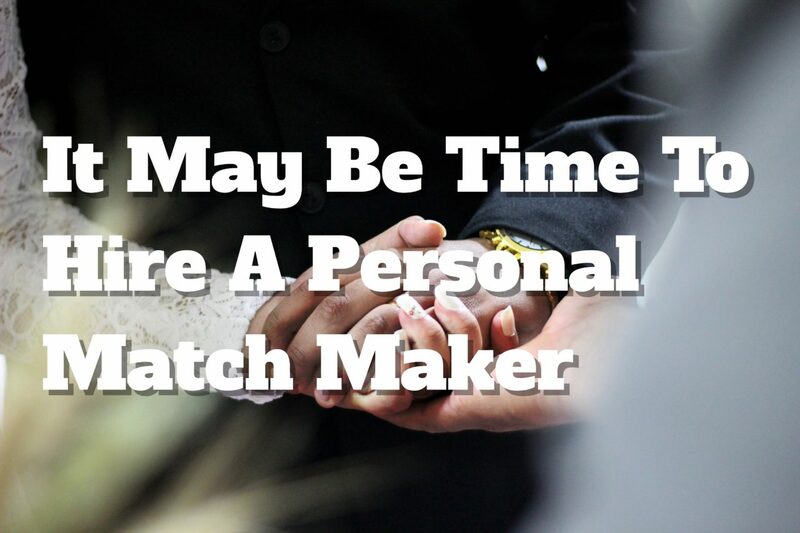 I don’t write this to say that everyone woman needs a matchmaker, but if you find yourself picking the wrong person far more than you find yourself picking the right person, why not allow someone thats knows what to look for pick for you? You ultimately get the choice on whether or not you drink the water, I just bring you to the lake. Email me now at EddieFews@Gmail.com for any inquiry. For One on One Live Coaching and Consultations via Skype, Phone, or Instant Messenger; Email: EddieFews@Gmail.com – ask about my free 15 minute consultation. Posted on January 1, 2018 July 25, 2018 by EddieFews	This entry was tagged arranged-marriages, Dating, dating-coach-eddie-fews, eddie fews, india-arranged-marriages, match-maker, match-making, matchmaker-eddie-fews, matchmaker-nyc, MatchMaking-Eddie-Fews-NYC, MatchMaking-New-York-City, personal match-maker, professional-matchmaker-eddie-Fews, Relationships. Bookmark the permalink.